Joachim Prinz (May 10, 1902 – September 30, 1988) was a German-American rabbi who was outspoken against Nazism and became a Zionist leader. As a young rabbi in Berlin, he was forced to confront the rise of Nazism, and eventually emigrated to the United States in 1937. There he became vice-chairman of the World Jewish Congress, an active member of the World Zionist Organization and a participant in the March on Washington for Jobs and Freedom. Prinz was born in the village of Bierdzany (near Oppeln), in the Prussian province of Silesia. Prinz was born to a Jewish family. Early on, he became motivated by a charismatic rabbi and Prinz took an increasing interest in Judaism. His Jewish roots grew even stronger following his mother's death. By 1917, he had also joined Blau Weiss (Blue White), the Zionist youth movement. As his prominence grew in Germany and his fears of Hitler's reign coming to fruition, he earned the sponsorship of Rabbi Stephen Wise who was a close adviser to President Franklin Roosevelt. In 1937, Prinz immigrated into the United States. He immediately began lecturing throughout the U.S. for the United Palestine Appeal, established in the 1920s as the fund raising arm in the United States for the Jewish Agency for Israel. It was, essentially, the precursor to what became the American Jewish support base for a nation state of Israel and the United Israel Appeal. Joachim Prinz settled in New Jersey as the spiritual leader of Temple B'Nai Abraham in Newark. 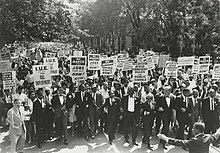 1963 march with Prinz and Martin Luther King Jr. Within a short period, Prinz's activism helped him rise to become one of the top leaders within the Jewish organizational structure. He held top leadership positions in the World Jewish Congress, as president of the American Jewish Congress from 1958–1966, and as Chairman of the World Conference of Jewish Organizations. Later, he was a director of the Conference of Jewish Material Claims Against Germany. Prinz's early involvement in the Zionist movement made him a close ally and friend of the founding leaders of the State of Israel. 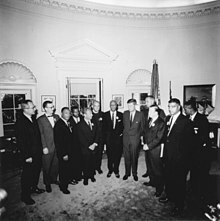 Prinz was essential to establishing what became the Conference of Presidents of Major American Jewish Organizations. Prinz was Chairman from 1965-1967. Die Neger in Harlem erinnern uns immer noch an die Zeiten von Onkel Toms Hütte. Wir verstehen deshalb nicht, daß auch die Juden dort die Neger höchst gleichgültig betrachten, und daß auch sie hochmütig sind... Wir können das nicht. Wir verstehen sie zu gut, die Schwarzen im Ghetto zu Harlem. "The negroes in Harlem still remind us of the times of Uncle Tom's Cabin. Therefore we cannot understand that the Jews there, too, regard the negroes with great indifference, and that they are equally haughty... For us [immigrants from Nazi Germany], this is impossible. We understand them too well, those blacks in the ghetto of Harlem." From his early days in Newark, a city with a very large minority community, he spoke from his pulpit about the disgrace of discrimination. He joined the picket lines across America protesting racial prejudice from unequal employment to segregated schools, housing and all other areas of life. While serving as President of the American Jewish Congress, he represented the Jewish community as an organizer of the August 28, 1963, March on Washington. He came to the podium immediately following a stirring spiritual sung by the gospel singer Mahalia Jackson and just before Martin Luther King, Jr. delivered his famous "I Have a Dream" speech. Dr. Prinz's address is remembered for its contention that, based on his experience as a rabbi in Nazi Germany after the rise of Hitler, in the face of discrimination, "the most urgent, the most disgraceful, the most shameful and the most tragic problem is silence." Prayers for the High Holidays, 1951. The Dilemma of the Modern Jew, Boston: Little, Brown, 1962. Popes from the ghetto: a view of medieval Christendom, New York: Horizon Press, 1966. The secret Jews, New York: Random House, 1973. Wikimedia Commons has media related to Joachim Prinz. ^ Reston, James via The New York Times, "The March's First Test: In The Churches", St. Petersburg Times, August 31, 1963. Accessed January 11, 2011.